No, I'm not talking about the kind of Mount Foldmore that is threatening to overtake my spare room. 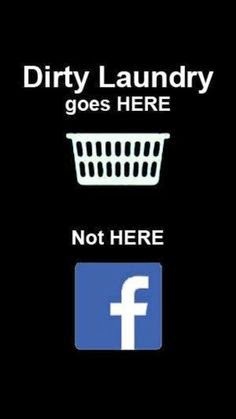 What I'm talking about is the social media type of laundry, the posts that make me pause when I'm scrolling through my feed(s) and think "Really?!" I'm sure we've all seen such posts, or know someone (who knows someone) who has posted something online that probably doesn't belong there. Sure, it's easy to do these days with the prevalence of social media access on our phones, tablets and laptops. It's a simple thing to snap a picture and add a quirky caption, or in a cranky or inebriated state post a ranty status online. At what cost though? Once something is online, it's online for good. You can't control it, or stop other people from sharing it. Even if your privacy settings are high, all it takes is one person in your network to forward that message out or to tag you in one of their own pictures for their network to see. It's done, it's out there and being cached and crawled and searched - getting it back is like trying to herd feral cats or protect your nice outfit from your children's sticky fingers. When I'm reviewing people for hire, I usually do a quick Google search to see what turns up. In fact, I regularly Google myself too. Let's just say, there are some interesting results out there. I worry for the social media users of today, some of who think nothing of drunken selfies, of public berating and pointed rants, and the publishing of information that might not belong in the public domain. Truly, I love technology, but what I don't love is the way that some people forget that behind every post/image, there is a flesh and blood human who has feelings, a reputation and a life. I know, some might say, but aren't you a mummy blogger? Don't you have Facebook and Instagram and post photos and stories about your life? And this is true, I do. But I'll be honest, I vet my stories. I only share what I'm comfortable putting my name to. Pictures of Ellie are watermarked, and the face of Mr Fork is never shown, at his request. I don't even use Ellie's full name. It's a fine and personal line to draw, but I try to step carefully through the landmines. I still allow unrestricted comments because I believe in free speech but I may change my mind one day. I post with my name, both on my blog and when I comment on other's work. I only say what I'm personally happy to stand behind. I choose what I put online and what I keep private. I try to keep my dirty laundry where it belongs - in my laundry basket, within the walls of my own home. I shudder to think how I will teach Ellie to do the same with the mixed messages out there and the way that technology is already so ubiquitous in her life. Given that this is Stay Safe Online Week, let's discuss. What are your thoughts? It's so true. I often have to blink as I read things online and think, really, you want to go there?! Thanks for stopping by!